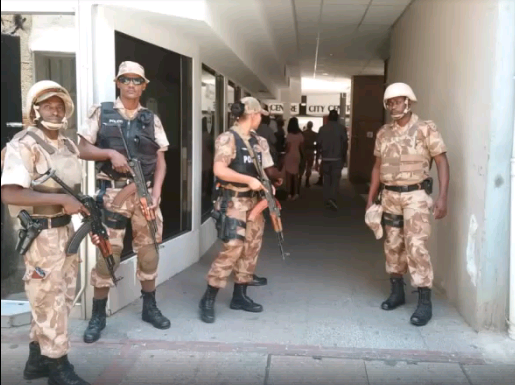 The central business district of Windhoek erupted in chaos after a man armed with a pistol entered the fourth floor of the City Centre building is above Cafe Schneider and shot two women in the employ of the Africa United group. From what could be established on the scene of the gruesome incident one of the victims that were wounded during the shooting was held hostage by the shooter. 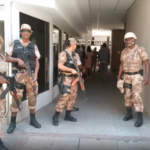 Heavily armed members of the Special Reserve Force of the Namibian Police reacted in full special operations gear to eliminate the active shooter. The commander of the Namibian Police in the Khomas Region, Commissioner Silvanus Nghishidimbwa, confirmed the active shooter situation and confirmed that one of the victims died as a result of the shooting. Commissioner Nghishidimbwa said the second victim was wounded and were taken to hospital for emergency medical care. He also confirmed that the suspect handed himself over to police shortly after he fled the scene and is currently in custody at the Wanaheda Police Station.